PocketSurfer 2R - mobile internet but no phone? Another gadget for your bag, sir? Datawind has unveiled the latest in the PocketSurfer range, the 2R, and thinks that this will be the answer to your mobile internet needs. Instead of worrying about all that 3G and Wi-Fi connectivity, SMS and taking pictures with your phone, this handset allows you to surf the web reportedly faster than the iPhone 3G... using just GPRS! Some of you tech-fans out there might be familiar with the PocketSurfer and the PocketSurfer 2 already, so what's new about this one? Well, there's the world's first (apparently) trackpad on a handheld device, similar to that found on a laptop. It has a 640 pixel full-colour wide screen for displaying web-pages in their original layout with full HTML, graphics, Java-Script, Ajax, Frames, and other wibs and web widgets. 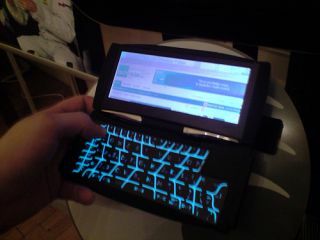 It also has a GPS chip and wide QWERTY keyboard, backlit so you can see it in the dark as well. The 2R has the letter in it for a reason - it stands for roaming. And the rate for this bad boy is just five pence per minute, as Datawind has decided that paying by the MB is just too confusing for most. And to be fair, it is. You get 600 roaming minutes for just £30, with a £30 top up required every time you go over that rate. While it may seem pricey for a trip away, it's around five times less than you would pay even with the EU's target in mind... it's best not to think about how much data roaming costs on your average mobile handset. 20 hours use per month is included in the cost of the device, and you can even upgrade to monthly usage for £5.99 per month, or £59.99 if you want to keep using it forever and ever and ever. The PocketSurfer comes in at £200 in the UK, and there will also be a 2L (L stands for Lite) version, with no GPS or trackpad and a higher 25p per minute roaming charge, coming in at £150. Available now, head on down to pick one up to put in that obscure pocket in your backpack.